Students wait to register for classes on April 9 in the newly renovated Student Center. Crews are finishing work on the building's exterior. The signs said it all. 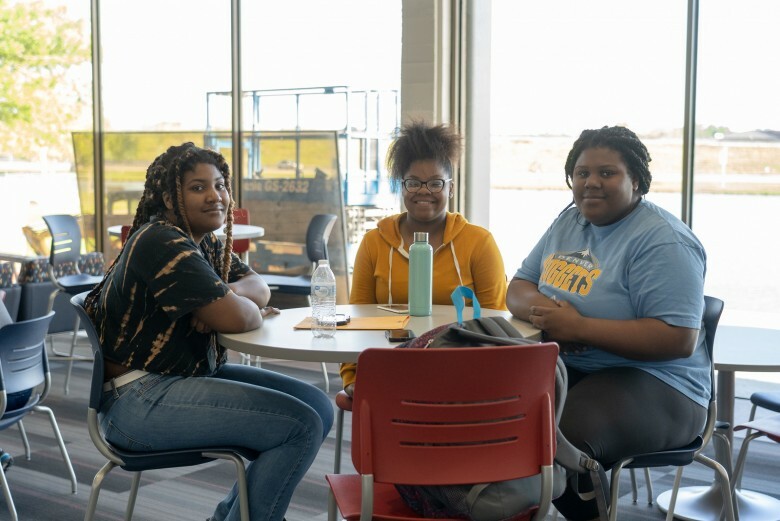 Registration for the 2019 Summer and Fall classes was moved from the Enrollment Center to the Student Center on the first day of registration – April 9. As soon as the doors to the newly renovated Student Center opened, a line formed at a help desk as students of all ages started to register for classes. Barbara Bolden came early to seek advice from a counselor on her options as she considers a career change. The former NASA biomedical engineer is contemplating obtaining a process technology degree to go with the bachelor’s degree she already earned at Louisiana Tech University. Bolden and Pamela Vallier of La Marque both were sitting in new, modular chairs in the Student Center commons. The commons area also has round tables and chairs as well as high top tables and chairs. Vallier commented the Student Center was much nicer than when she first enrolled at COM in 1986. She has attended COM off-and-on while working full-time as a patient care technician. On Tuesday, she was waiting to sign up for two classes needed before applying to the nursing program. The Student Center will be home to employees who had been housed in the Administration Building/Enrollment Center. Office furniture was moved over the weekend and employees set up their offices on Monday. The only employees not moving to the Student Center are those within Financial Services (business office) – controller, controller's administrative assistant, payroll, accounts payable and the grant accountant – who will relocate to Appomattox Square, Suite 4. The decision to move employees into the Student Center was made after the Enrollment Center flooded in September. The building already was scheduled to be demolished to make way for a new Student Success Building. The timeline for the new building also was moved up because of damage created from the flooding. The Student Center underwent a complete makeover over the last year with new insulation and exterior walls, new flooring and furniture. Crews area completing exterior work on a terrace overlooking the lake plus a canopy and sunlight screens to shade the area and existing glass wall. A grand opening of the Student Center and dedication of the Bennie Matthews Commons is planned for Monday, April 29 at 3:30 p.m.